The business capital represented by expensive assets is running under capacity. Some wagon are loaded only 2-3 times per month. 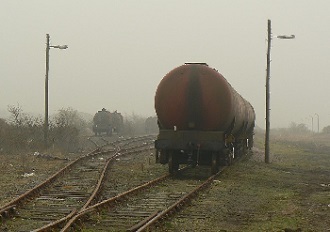 Rail access to the connected entreprises to railways requests a complex procedure where one big diesel locomotive pulls only 2 or 5 wagons. These transports must be accompanied by two or three people for the various manoeuvres, in opposite to HGV where only one person is required. Some factories send no more than 2 wagons per week which use many paths for so little. That obstructs main tracks with many little freight trains’ movements which must fit into the regional and national traffic. In Switzerland, in the kingdom of railway, the question of single wagon load and marshalling yards was discussed. With result that many industrial connections used only one time per week were disused. In addition, many freight train movements are directed to the marshalling yards, increasing more travel time in terms of sorting of wagon, of composition of the trains and waiting times. That means that some wagons perform only 100 km with more than 24 hours. For international transport across Europe, some services of single wagon load requires more than two or three days of travel ! Politicians and industrials have listened carefully to the opportunities provided by road sector. The concept of approach distance and the geographical dispersal of industrial location play a crucial role. According to a French report of 2003, 75% of tonnes loaded are intended for journeys of less than 150 kilometers. The importance of short-distance transport has strong implications because this modal demand can be only met by road transport. Facilities for loading / unloading are other factors that make attractive road transport. 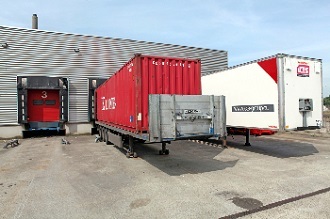 Each truck has its own loading door as shown picture above, and it is easy to move each unit separately as needed. This facility does not exist in the rail mode because it requires many operations within the company. Some small businesses only need two or three doors. To remedy this problem, one would think the intermodal transport is the solution. Unfortunately the terminal is always located at 50 or 100km of the entreprise. If you must travel for only 70 or 120km, that means your destination is at equally distance than the terminal itself ! In many industrial areas, there are just simply not of intermodal terminal. One would think the pooling resources (locomotives, drivers…) can reduce cost, but in practice, this is a source of concern. Passenger services cannot be managed practicably as the freight services because workload differs dramatically. State-owned railways have an obligation to handle any type of situation, as required by the public service requirements. This results some waste and inaction. A solution often mentioned was given to freight services own resources. But unions are very wary because they suspect that autonomous units can weaken their balance of power and that would lead to a privatization of part of state-owned railways. The business capital represented by expensive assets is running under capacity. Some wagon are loaded only 2 or 3 time per month and performances are not very high. In a single-integrated railway, some depots have fear that the locomotive used during the night will not be available the morning because the predominance of passenger services requires that the rolling stock must be ready at the beginning of the rush hours . Freight services are managed at a down level and must be inserted into the passenger timetable which has priority.